Love the Batmobile in Batman: Arkham Knight? If you live in the U.S. or Canada, here’s your chance to own the car for real. Or at least something that looks like it. PlayStation is giving away a Batmobile built by Tim Baker Creations, the props and makeup team behind Super-Fan Builds. To enter, all you have to do is take a picture of yourself with a Batman: Arkham Knight PS4 bundle, then tweet the photo with the tag #PS4BundleSweepstakes. Just to be clear, you don’t have to own or buy the bundle. 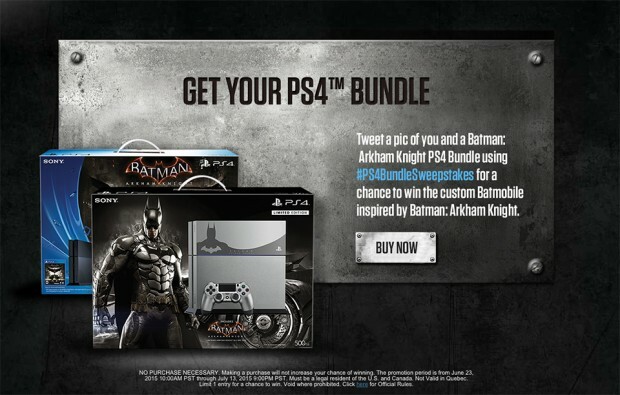 For instance, you can get a shot of the bundle at a game store. The sweepstakes ends on 7/13/15.